A picture of one of the variations in use. Courtesy of Andreas. 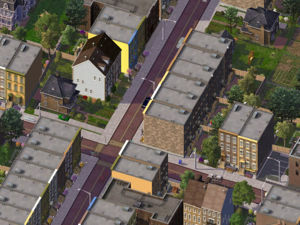 The Street Addon Mod, usually abbreviated to SAM, is a mod developed primarily by jplumbley and Diggis of the NAM Team, which allows for multiple Street network texture sets to co-exist in a single city. New technology was found early 2007 which allowed the NAM Team to use a Puzzle Piece to create a starter for a new set of textures for the same network. The SAM takes advantage of this new technology to its greatest potential. The initial Version 1 release of the SAM, containing 5 texture sets, was released on September 15, 2007, one of the few instances of a NAM Plugin being released separate of a NAM Core release. This expanded further with Version 2, which included 8 texture sets. The Version 3 release in April 2008 improved the mod's functionality and added diagonals to the SAM. After the Version 3 release, a thread was set up to solicit new texture sets for inclusion in a proposed Version 4 release, or to include in texture replacement mods. None of these sets has been completed as of this writing. dedgren also included some Wide Radius Curves for several of the SAM texture variants in the Rural Roads Plugin, released in March 2009. In September 2017, an update by eggman121, released as part of NAM 36, added support for draggable Wide Radius Curves. In addition a new SAM set, IndustrieSAM created by Mgb204, designed to blend in better next to industrial zoning was added. This page was last modified on 9 January 2018, at 04:10.